Lakeville Police Chief Jeff Long introduce our speaker Deputy Police Chief John Kornmann. 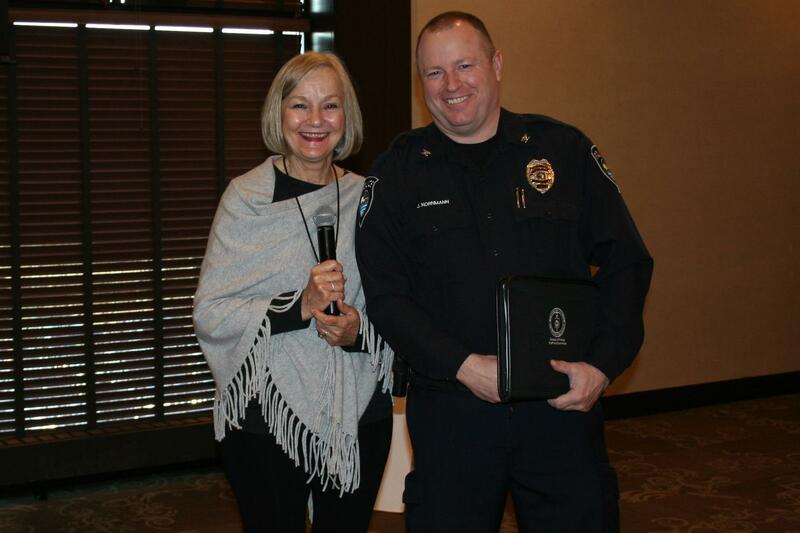 Kronmann was instrumental in obtaining an $106,000 federal grant for the City of Lakeville’s body-worn camera program. In the coming months all Lakeville Police Officers will wear the cameras in an effort to improve accountability and transparency between the police and the community. Kronmann mentioned that Burnsville police became the first in Minnesota to use body-worn cameras in 2010, about the time that many departments around the country began adopting the cameras partly as a response to public outrage over excessive use of force by officers. The Lakeville Police Department officials are in the process of holding individual community conversations with small groups through the community churches, chamber, local organizations to share and gain input for the creation of a Lakeville Police Department policy for body-worn cameras. LPD is anticipating authorizing the purchase of cameras in June and begin using them by early fall. Kronmann mentioned that officers will be required to use the cameras on all calls, whether arrests, interrogations or any interaction “that becomes or is anticipated to be adversarial.” The Canine will not be using the cameras, but the K-9 officer will.